The story about Shanie Bar-Oz, the owner of a unique shop called Lavan, carrying made in Israel products, in Vancouver, Canada, still makes headlines. Shanie, a young Israeli woman, stood, almost alone, against the waves of anti-Israel protests that attempted, again and again, to put enough pressure on her so she will succumb to fold and close her fledgling business. “The economic boycott on my shop have stemmed from one motive – being an Israeli brand, that has bragged about it in the main street of the town,” she states. In 2001, the NGO Forum World Conference Against Racism, Racial Discrimination, Xenophobia and Related Intolerance that took place in Durban, South Africa, called for “mandatory and comprehensive sanctions and embargoes, the full cessation of all links – diplomatic, economic, social, aid, military cooperation and training – between all states and Israel.” Mary Robinson, then the UN Human Rights chief, said about the conference that there was “horrible anti-Semitism present” at the NGO Forum. In 2004, the Presbyterian Church, USA, General Assembly voted to divest funds from Israel, saying it would “target businesses that it believes bear particular responsibility for the suffering of Palestinians and will give them a chance to change their behavior before selling their shares.” In 2006, a resolution was adopted, which would lead to “repeal and rescind the actions of the 2004 General Assembly” vote. In 2004, a group of Arab-Palestinian academics and intellectuals launched the Palestinian Campaign for the Academic and Cultural Boycott of Israel. This campaign called on the Arab-Palestinians for a comprehensive economic, cultural and academic boycott of Israel. In October 2003, the Arab-Palestinian academics and intellectuals called for a boycott of Israeli academic institutions. In 2006 and 2007 the Occupied Palestine and Syrian Golan Heights Advocacy Initiative (OPGAI) presented a call for boycott, divestment and sanctions (BDS) against Israel to the World Social Forum. Shanie and I have kept in touch. Since the Jewish High Holidays are just around the corner, I was curious to know if the protests subsided and business has improved for Shanie since the first horrible BDS protests in front of her Lavan store. Shanie was frank and told me that her business could use a morale boost. In my interview with Shanie, herein, I am proud to introduce to the reader an exceptional young woman, the nation of Israel should be very proud of. NG: Tell me about your line of product you named Lavan. SBO: Lavan is a healthy alternative; it is the new kid on the block. Our product line is natural, containing a fine collection mostly fruits, vegetables and plant extracts, unlike Sabon, Laline or Ahava, which, except for the organic products they sell, are not that much different than the Body Shop’s ingredients. All Lavan’s products contain the Dead Sea Minerals, therefore, they are natural solution for skin disorders, dry skin, stretch marks and also provide an amazing anti aging effect of 40% stretch in the skin (Wikipedia!). But most important is our name LAVAN, that is cooler. NG: Are you alone facing the protesters? SBO: I’m not entirely alone in this situation; all in all I have to defend my Israeli brand that is second year in business, and is struggling for a place in the marketplace. The message to expect demonstrations in front of my store was sent to me by the local Jewish Federation. They have done all that is in their power to convey the message to local Israel’s supporters. It is important to mention that the economic boycott on Lavan stemmed from one motive only, the very fact that it is an Israeli brand. All kind of stories have circulated about Lavan in dishonest advertising brochures, according to which Lavan prevents the access of Arab-Palestinians to their land and the Dead Sea and that Israel denies the Arab-Palestinians their rights in order to produce soap and get rich. My first shock, followed by great pressure, emanated from the fact that here in Vancouver no one made a big deal story about the protests. I received all kind of fool’s advice, among which to lower my profile and wait, patiently, for the storm to pass. I am a proud Israeli. One of the most prominent motives to establish Lavan, the choice of the name and the character of my brand, as well as the production location, stems from me being a proud Israeli. I love Israel, I miss her and the people with every breath and I am proud to represent the county with every demonstration I make to a customer coming through the door and show off what a great natural cosmetics we know to produce, everything from Mother Earth. Only that this piece of land attracts a lot of attention…sometimes, the wrong attention. 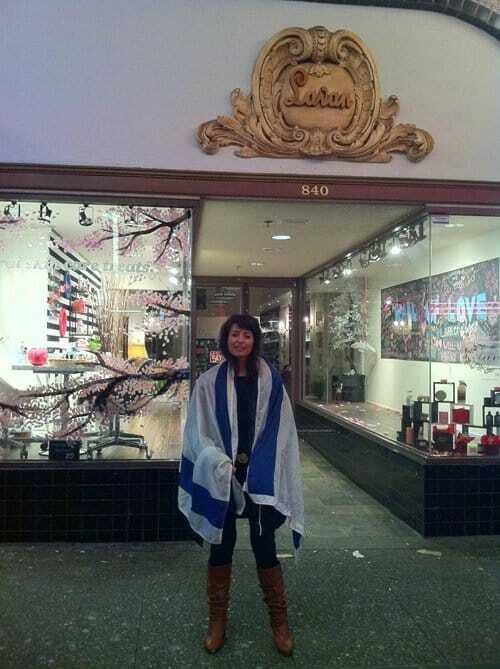 NG: Is there not an Israeli community that supports you in Vancouver? SBO: The Israeli community here is small and the Jewish community did make an effort that I appreciate and respect. NG: How did you get to Vancouver? SBO: I chose Vancouver for several reasons: first, it is a stunning city that has a population with a high awareness to health; they appreciate the natural cosmetics and thankfully they respond very positively to the fact that they are Dead Sea products. Additionally, the Canadian economy is stable and the weather in Vancouver is relatively comfortable, not as cold as can be described in other parts of Canada. NG: Why Vancouver, while Israeli communities in the US would have received you with more open arms and certainly would have provided you with protection against anti-Israeli demonstrations? SBO: I admit that I did not think about this at the time when I chose the first location for Lavan. God bless you for suggesting this. In short, I thank you for better remembering how to love. NG: What can you tell us about the Jewish and Israeli community in Vancouver? SBO: There is the Jewish Federation and there are the rabbis of all sort. I do not really know who leads the community and if the community feels as a cohesive community at all. I do not know about their general attitude toward anti-Israel protests. What I do know is that there is a list of supporters for Israel and those people I had the “pleasure” of meeting and got to know. When they come to the shop, with a smile, and strengthen me, when they buy a soap and tell me – we have heard about you, we have read about the protests, be strong; that is my community and they are charming, one by one. I was very pleased to find Jews, non-Jews and Israeli supporters; this is really touching! People who have loved me before we have even met. Because I was born in the right country, a daughter of the chosen nation who belong to our unique culture. It is really exciting. As someone who has lived 30 years, out of 34, in Israel, I had no idea that there are so many people who contribute of their time to and have love for my nation, my family, friends and for me. Now, suddenly, I had names and faces and a warm hug, just like a mother. NG: How were things during the height of protests? SBO: The months of the demonstrations were very difficult for me. You can ask the manufacturing plants in Israel. I am still making late payments to them. I missed the business during the High Holidays season and the protesters followed Lavan’s Facebook page and came to demonstrate each time I tried to promote sales again. You have to understand, we are talking about the height of season when everyone buys gifts. Who wants to smell a cream and try eye cream when outside there is a demonstration against your business? Who would want to demonstrate a product?! I play Israeli music in the shop; part of my team is Israelis. At that time I had two Muslim workers and I am still very proud of it. It concerns Israel and as a result Lavan and I promote and encourage peace. These Muslim workers got entangled in a very embarrassing situation. One quit work immediately and the other left after about two months. There were suppliers who were not interested in working with me; for example, someone who paints front windows excused herself with a claim that it is too dangerous for her and her insurance does not cover her work (in my store only…!). And the most difficult part was the Internet. If you do a search on YouTube with the word Lavan, Vancouver, the results, their videos come up first. At the same time I tried to raise money from private investors, since I did not have all my immigration papers in order and therefore I could not obtain a loan. But that investment turned risky and thus unworthy. So you can guess how much money I managed to recruit. NG: What is the general response to your Lavan brand? SBO: I am pleased to say that the response to the fact that my products are manufactured in Israel – there is the Israeli national flag, a sign and facts say it when entering the store -is, in general, fabulous; they summarize it with one word, “Wow.” And there is every reason to make me proud. I play Israeli music in the shop and there are great comments from customers who fall in love with our singers. The atmosphere is open, warm, genuine, just like at home. I am glad to be a center for Israelis or supporters of Israel and my store’s location creates an informal meeting place where one passes by to say hello when in downtown. This is a great feeling that if I make enough effort I succeed to feel as if I am in Tel Aviv. NG: With a hand on the heart, are people buying less because of the protests, or, in fact it helped in Public Relations? SBO: Thank G-d it did help in Public Relations. At least something good came out of this story – I met a lot of wonderful people, like you. My Israeli pride only strengthened. Also the concern. We have to react much more effectively and severely. In my opinion ignorance is rampant. If we do not look back into our history, we sin to the core of our very existence as a people. This is how it begins! Ignorance, students’ demonstrations, burning of a synagogue, riots, burning of books and the rest you know just like me. This must be stopped at the ignorance and illiteracy level. I was surprised to find out that the number of Arab protests and responses online were in a single digit. The vast majority of the protesters were white Leftists who think they rise to help the weak and oppressed against terrible, militant and brutal Israel! Our situation with respect to our image is not at all good. That still bothers and worries me a great deal and I keep, as much I can comprehend and do my best to work on this matter in my little piece of heaven here. NG: What can you tell us about yourself? SBO: I was born and grew up in Haifa; I am 34 year old, the youngest of four children, all live in Israel, including my mother. My father passed away 5 years ago; this is probably why I wanted to leave to somewhere else and be away from the pain. Before leaving Israel I graduated, with honors, with a law degree and business administration from the Interdisciplinary Center (IDC), Herzliya. I was hired to work as a lawyer with the third largest law firm in the country, the so-called pride of my Polish mother. For the past four years I have been living in Vancouver. I have traveled back and forth – Israel-Canada, few time a year, until two years ago as I was still waiting for my immigration application to be completed, which has been taking much longer than I was planning and prepared for. In the meantime, I fell in love and got married…no children yet. If only…they say it is the taste of life, is not it? NG: Let us go back to Lavan. Tell us about the products you developed and your sales online. This moves me every time; I take pictures, I document it and smile; I succeeded, they love it! Lavan offers a collection of products that is appropriate for every occasion, i.e. birth, wedding, birthday, or just a treat for a mom, daughter, husband. It appeals to the consumer who likes to be pampered and spoil others. Fragrant soaps, lotions of fine texture that enrich the body with all the needed vitamins and minerals lacking in the diet of most of us. From shaving cream for men to the cream to help stretch marks disappear. All natural and reasonably priced considering the good quality of the ingredients. All Lavan’s products are non-Paraben – a very unhealthy material that can cause cancer, which, unfortunately is used in most of cosmetics today; also it is not tested on animals and is recyclable. Natural, simple and luxurious. NG: Is your online business doing well? SBO: My online sales are embarrassingly low. In the coming months I will be launching a new site, interactive and easy to use, which I hope will help those not living in Vancouver to order Lavan products from afar. Oh’ yes, these days I am conducting negotiations to open a store in Israel, which I think is about time! NG: Thank you Shanie for the interview and I wish you the best of luck. 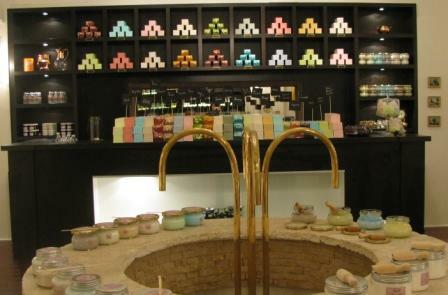 Your store and the Lavan line of products are exquisite. SBO: I’d love to receive any help that you can give me; in all honesty I truly need it. And many thanks that you care to listen. NG: Chag Sa’meach – Happy New Jewish Year.